"Ahamo", ex. "Plume", was built in 1931. Lost during WW2. Built 1926 at Lithgow's, Glasgow, Scotland, as Plume for the Vacuum Oil Company. Entered Socony's British-flag fleet with the merger of 1931. 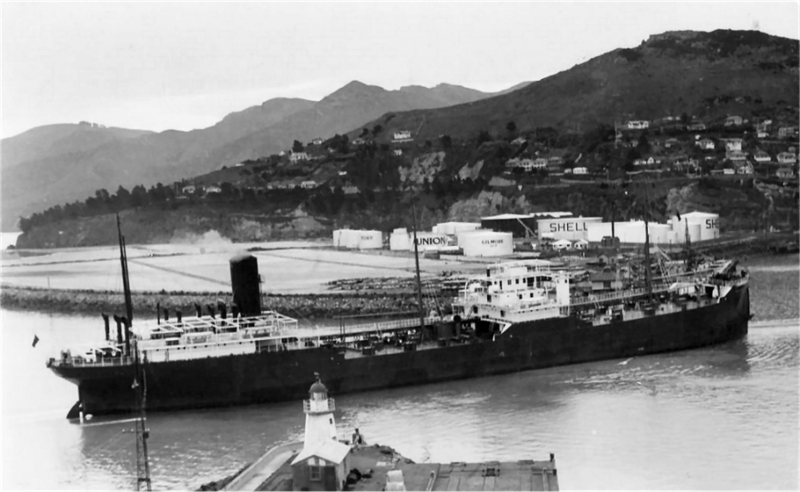 Vacuum Oil Company had a product which it marketed as Plume Motor Spirit - hence the origin of the former name of this ship. Ahamo was requisitioned for WWII by the British Ministry of War Transport and put in the supply train which bridged the North Atlantic. On 8 April 1941, while serving as the Commodore's ship of a convoy leaving England, she struck a mine in the swept channel out of Grimsby. The explosion, occurring on the port side aft, wrecked and flooded the engine-room and adjacent crew quarters, sinking Ahamo in shallow water with her bow still buoyant. Fearing the possibility of an air or E-boat attack at daylight. Captain T. Potts gave orders to abandon ship. The survivors were picked up and returned to Grimsby the same day. Attempts to salvage Ahamo were unsuccessful and she was declared a total loss. Thirteen men lost their lives.